Share Trades with the Community. Sharing some of your trades with the trading community is a great way to get feedback and learn - and Tradervue makes this easy. Tell people why you got into that trade, what your plan was, and whether you followed your plan. Trade didn't work out? Share that too! Not every trade is a winner; help others learn from your trade, and learn how great traders get out of their losing trades. See some shared trades from others! You choose which (if any) trades you share. Sensitive information like your P&L and your share volume is excluded from the shared trade. Just your notes, your buy and sell points, and the charts you select are shared - share everything that's educational, and nothing that's too personal. If someone else has shared a trade in a symbol that you were also trading, you'll find out about it right on your dashboard. Compare notes! 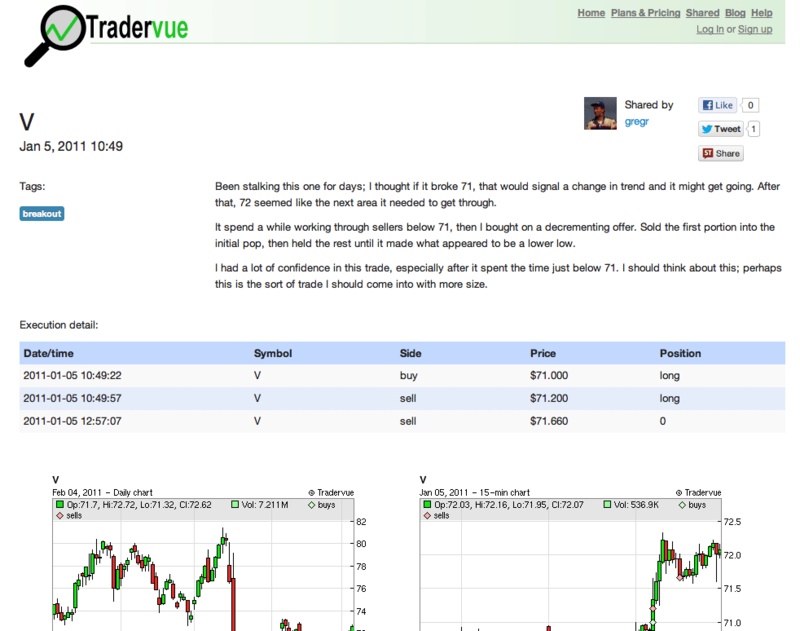 By default, shared trades in Tradervue are shared without volume and P&L information. However, if you prefer to share trades with your P&L and volume, you have that option. It's up to you!